Human knowledge has developed over the centuries, and we now have a much firmer understanding of chemicals and how they react with each other. Humans had no qualms about drinking dirty water or food and did not connect it with any illnesses they may have gotten. Contamination just was not something that those early humans understood. Now that we know better, we are fully aware of the dangers that germs and bacteria represent. Every day, we do things to help prevent the spread of those germs and keep ourselves from getting sick. This is important when it comes to pool maintenance. We use chlorine to sanitize our pool water and keep it pure. Here are some reasons why we need chlorine in our pools. The water in your pool can come into contact with contaminants in many ways. They are often presented to the water through humans, but they can also come from nature. Humans sweat, wear cosmetics, and emit bodily fluids. These can all end up in pool water. Dust, debris, and bacteria can be swept into the water on the wind, can fall from trees, or can be left by rodents or birds who end up in the water. While an indoor pool might be able to protect from the natural sources of contamination, it cannot protect against the human source. Keeping to a regular chlorination schedule is one of the most important steps in any pool maintenance schedule. It will help ensure that the water is kept at its most hygienic level at all times. What happens when chlorine is added to the water is that it breaks down into chemical compounds. These compounds are mostly hypochlorous acid and hypochlorite ions. To make sure that the chlorine is at its most effective, the pH level of the pool needs to be at the right level. That means keeping your pool water at a pH of 7 to 8.4. 7.4 is, in fact, the perfect level. Why Does Chlorine Work So Well? As mentioned, human scientific knowledge has vastly improved when it comes to chemical reactions. When chlorine takes the form of the hypochlorous acid or hypochlorite ions, it attacks the lipids that are present in bacteria. It will also kill enzymes in the bacteria. This, in effect, kills the bacteria and makes it safe. Since pools have so many microorganisms and bacteria in the water, chlorine is a great way to get the water safe for us humans to use. There is no doubt that chlorine is a great way to cleanse pool water and make it safe for swimming. However, it does come with some drawbacks that all pool owners should have in mind. First off, it does have that familiar strong smell that is just not unpleasant, but it can irritate the nose. Chlorine can also cause itchy skin to certain sensitive skin types. 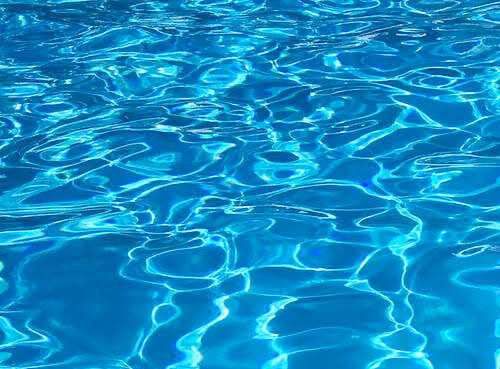 Hypochlorite ions have a tendency to adhere to clothing fabrics, so it is vital to rinse off after getting out the of the pool, otherwise your swimwear may start to have fading colors. If there is too much chlorine present in the pool water, it can even lead to breathing and lung issues, as well as other health concerns. As pool owners, we all want our guests and our families to enjoy swimming in the pool and cooling off on hot days. It is necessary to add chlorine to make sure that everyone can enjoy the water safely. However, it is important to make sure that the chlorine is handled and used properly at all times.